To improvise freely on the guitar, you need to be able to play the same idea in many different places on the neck. Otherwise, you could find yourself playing at the twelfth fret, hear an idea that you only know how to play at the fifth fret and not be able to execute it. First, you must know where all of the notes are at all times. Then you need to learn every possible location for everything you play – scales, chords, arpeggios, you name it. While you will undoubtedly develop your own favorite ways to play things, knowing all of the possibilities allows you to make choices. 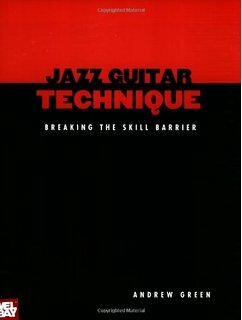 Beginning guitar technique usually involves learning scales and arpeggios “in position.” Improvising freely, on the other hand, necessitates being able to move quickly from position to position, in effect eliminating the concept of playing “in position” altogether. Follow the string (below notes) and finger (above notes) indications to get the intended benefit. Your picking hand needs to produce the desired volume and emphasis for each note you play. Having this control not only gives your playing confidence and authority, but helps develop good time. Practice with a metronome. Always use a metronome when you practice. A metronome tells you one thing only: how fast you’re going. It doesn’t help you swing or be more creative – it just plays the pulse. Practicing with a metronome reinforces the idea of playing everything in time. You can emulate a drummer’s hi-hat by placing the metronome on beats two and four. If you want to play with a backbeat, put the metronome on beat three. If you are reading something for the first time, set the metronome at a tempo that is slow enough so that you can play without mistakes. Play simple rhythmic ideas. Playing a simple rhythmic phrase with the metronome will help give your playing a solid feel and develop assertiveness with your picking hand. To practice this technique: Hear the metronome on all four beats (at first). Play the following phrases in order, starting with #1. Play each phrase for 5 or 10 minutes at a stretch, or until it “locks in” and really feels solid. Do this daily, and over a short span of time you will start to notice that your picking hand has developed more authority.